It's everywhere and I can't decide what to do. I've seen rompers and jumpsuits in almost every high end catalog this season, but I'm not sure that I'm convinced I can pull it off. Sure, I wore a romper in the 70's as a child, but who didn't during that time period. Someone once told me that if you wear the trend the first time around, that you should pass on the trend when it returns. As I'm thinking about it, I wore a romper as a very young child in the 70's and again for a brief time when it made it's return in the early 90's. Do you remember that? Does being in elementary school count for the first time a fashion trend was popular?? Babies and little children wear rompers and jumpsuits all the time. Some of my minnies' cutest outfits as infants were rompers. I saved the most precious rompers from Strasburg Children that are smocked pink and white seersucker so that they can keep them for their children someday. There's nothing cuter than a little boy wearing a smocked Jon-Jon in the spring. Rompers and jumpsuits are a-ok for children in my book. In fact, my girls are both wild about the Tippi romper from Lilly Pulitzer and it is on my "to buy" list for them. 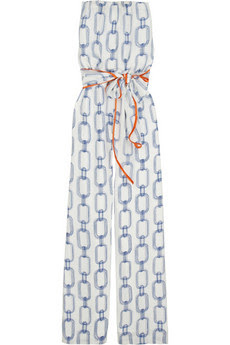 It's perfect as a coverup or to wear for play. But beyond the teenage years, as an adult, I'm not so sure. Although I'm colorful in the way I dress, at heart I'm fiercely conservative and don't often fall for passing trends. (Yes, I jumped on the one shoulder train with the Roe top, but that's different. . .) If I were 5'10" instead of 5'4", that might help the romper/jumpsuit situation, too. There's a fine line between a romper looking like Chrissy AKA Suzanne Sommers on Three's Company and being Palm Beach chic. It's also somewhat of a hassle to go to the restroom in a romper or jumpsuit. You know, a girl must be practical about certain things. Here are some rompers that I like for spring in theory, although I doubt that they'll make it into my closet. Social Thread jumpsuit. I can actually see myself wearing this one. 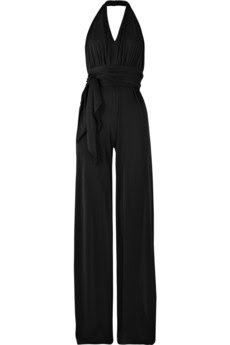 . .
Halston Heritage stretch jersey jumpsuit. We're getting warmer with this one, too, although I still prefer to wear dresses. Jules Reid is also going to have a jumpsuit for fall. I previewed this and it is very pretty. So what do you think? Are you going to wear a jumpsuit or romper this spring? Cast your vote or comment now! P.S. Did you enter the fabulous giveaway from The Pink Dog? Be sure to check yesterday's blog post for full information for this fantastic giveaway. Yes, I love rompers. I think they're so pretty and cute, but I don't think you'll see me in one. Unfortunately they wouldn't fit me right, but they look beautiful on the models...as usual, haha! My first answer was hello no! Then I saw the ones you posted and it turned into a maybe! LOL. I think wearing the trend as a child doesn't count. You can do it. Especially with how chic it is!!! I won't do any trend I've worn as a teenager on. That's my rule. LOL I just left a comment on another blog about how I did the fad 20ish years ago and wont be doing it this time around! I think if you have the bod...go for it. Never... I would look like an Easter egg. P.S. I got the girls' cards yesterday and I want to frame them they are SO CUTE! Please tell the minnies thank you and that they made my day! I may be a bit biased since I worked on the Danni Romper but it really is TDF! It is the perfect summer outfit and I can't wait to get it! 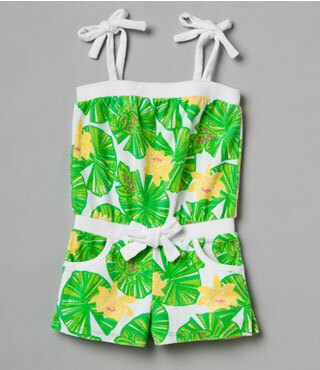 I love the idea of the romper, I'm not sure its going to work for me, but I'm certainly going to give it a whirl! Planning on getting the romper for the minnies, but since I'm only 5'3" on a good day -- I don't think the style would look right on me. I do think they're adorable, though. I voted "NO WAY" but I do like that blue and white one...the long one. I am definitely a jumpsuit kind of gal. I've got 3 hanging in my closet right now. As far as the rompers go...I'm undecided. I have 2 made of cotton that I sleep in, but even at 5'8" I'm not sure how much of my thigh I'm trying to show off. I'll have to think on it... Because they really are precious! If I found one that was flattering I would go for it. I think I am too tall for the look-I'll just look like I couldn't find something that fit! I feel the same way - VERY hard to pull off unless you're 5'10". Also - I saw a girl wearing one last summer and she looked like she had a constant...umm "wedgie" while walking down the street and it wasn't very attractive. I know my body is not meant for rompers - but if you go for it I know you'll look fabulous! I use to live in the terry cloth rompers that tied at the shoulders during my college days - perfect for my UF classes ;) ...and then again in the early 90's, I had a few of the long pant, jumpsuits. those thing were impossible to go to the bathroom with the zipper up the back! Think I will pass this time around! Stella and Dot ~ Minnies Style! Acne Cream to the Rescue!